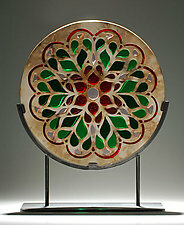 "My art encompasses clay and glass. The clay is smoke-fired to evoke a stone-like finish. 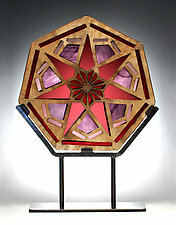 The glass allows the light to create its own fire, changing as the light of day changes. 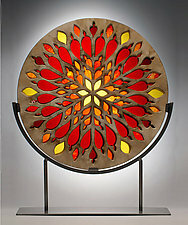 This combination of earth and fire uses mandala patterns of old. 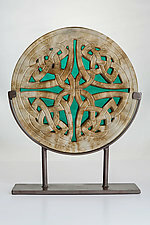 My aim is to bring the motifs of ancient cultures into a contemporary form." 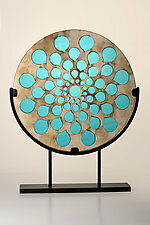 Fascinated with the power of clayworks within various civilizations, Melody Lane developed a vocabulary of rounded and circular shapes with her series of clay mandala forms. 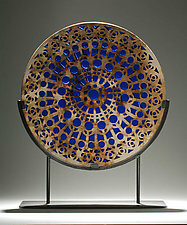 Each mandala is comprised of two large clay disks, which are created using a slab roller. Lane hand carves negative space within each disk so that the two are mirror images of each other. 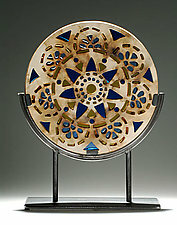 After slow drying, the disks are fired in a kiln, then smoke-fired, and varnished. 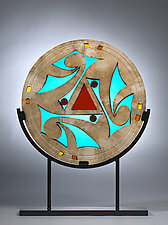 Stained glass is cut and adhered between the disks and the edges are grouted, smoke-fired, and varnished. 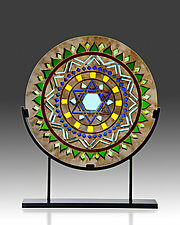 The finished mandala is placed on a painted metal stand, which allows light to pour through the stained glass, changing with the light of day.